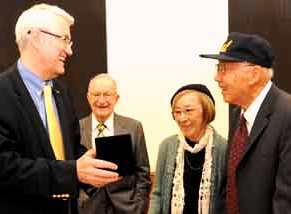 Congressional Gold Medal issued to Nisei soldiers. “I can’t think of any better place to send (the medal) to than this university,” Sayama said after the ceremony. He noted that he spent many hours at the Bancroft, including on the day he was scheduled to take his Ph.D. oral exams. He said he got so involved in his studies that he forgot the exam until someone asked him about it that night. Fortunately, he said, his professors allowed him to reschedule. Friday’s ceremony was attended by Sayama family members and Bancroft staff, including Bancroft Director Elaine Tennant and Theresa Salazar, curator of Bancroft’s Western Americana Collection. That collection includes the U.S. government’s Japanese American Evacuation and Resettlement records from World War II, which are supplemented by personal papers from Japanese Americans in wartime internment camps. The materials, along with those from seven other institutions, can be found in the online Japanese American Relocation Digital Archives. Sayama was attending UC Berkeley when President Roosevelt issued the internment order in February, 1942; after he left school to look after his parents, he was sent to the Rowher War Relocation Center in Arkansas. Chancellor Birgeneau accepts the Congressional Gold Medal from Kenji Sayama and wife, Sue. John "Jack" Rosteon, Class of '42, looks on. Photo by Peg Skorpinski. The diploma he had earned (based on his mid-term exams) for his undergraduate work in zoology arrived in the mail while Sayama was interned. That enabled him to teach science classes for youth in the camp, for which Sayama said he earned $9 a month. A black-and-white photo of Sayama in a Rowher classroom was recently uncovered in Bancroft’s Relocation Authorities records and was on display Friday. During his internment, Sayama enlisted in the U.S. Army and served four years. His time was split between officers’ and Military Intelligence Service training in the United States, and service in Japan. Later, Sayama returned to UC Berkeley on the G.I. Bill, receiving a master’s degree in 1950 and a Ph.D. in 1953, both in zoology. It wasn’t until 1992 that Sayama was able to don the traditional cap and gown and formally receive his degrees at UC Berkeley in a special convocation ceremony for all 17 other Japanese Americans who had to leave UC Berkeley before their wartime graduations. John “Jack” Rosston, the Class of ’42 classmate who gave Sayama his diplomas at that event, also attended Friday’s Gold Medal program.